Alexander Payne truly has a knack for relaying the road story on screen. You need more than an echelon of soul, characters whose individual hearts collectively beat in time with the narrative, and a narrative that quips comically, evolves raucously and affirms genuinely. In Sideways, he created a cinematic Everest, a pinnacle that will require something pretty spectacular to reach. And although Nebraska — Payne’s latest venture into the genre that sees characters finding their way around town before finding themselves — doesn’t quite reach the Sideways summit, it’s still a comforting, humorous and reminiscing ride. Absolutely dead-cert he’s stumbled upon a one million dollar sweepstakes letter, getting to Lincoln, Nebraska is the first, last and only thing on Woody Grant’s (Bruce Dern) torpedoing mind. If it weren’t for highway patrol, he’d have walked there. His end goal momentarily scuppered by the confines of a police station and a sigh-fully approaching son, Woody mentally prepares a case for action. Because in his eyes, there’s a mound of cash crying out to him at the end of a Nebraskan road. Son David (Will Forte) believes the letter is a scam, and initially denounces Woody’s nonsensical intentions. However, after a number of persistence-driven incidents, David agrees to chauffeur his father towards the elder’s prescribed destination; probably not out of curiosity, rather, in order to spend time with his ageing old man. 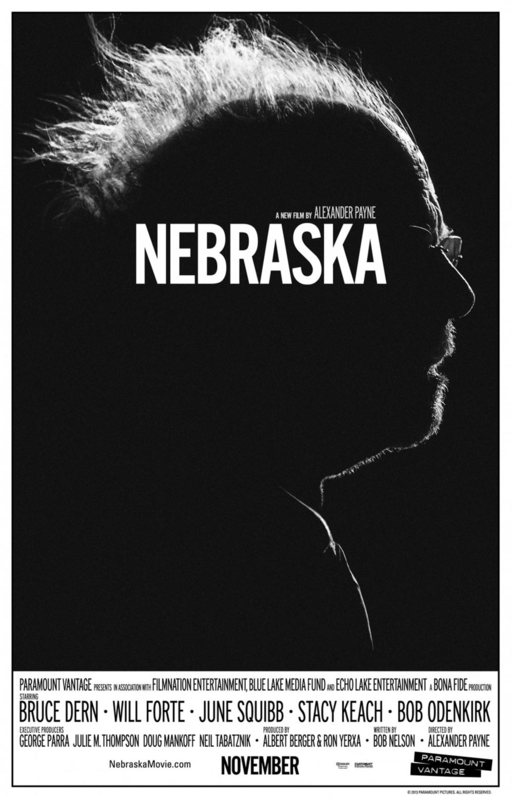 From its elegant cinematography to a perfectly poised story, Nebraska evokes a sense of accomplishment and craftsmanship. Of course, the road-trip mantra will always centre on character study, and it’s no different here. However to not acknowledge the technical prowess on display would be doing the film a disservice. The black-and-white scape works both as a visual appeasement and as a narrative cog, as it represents not only the blunt tone, but also Woody’s depreciating mind and somewhat selfish outlook. In composing a curtain of sound, Mark Orton infuses proceedings with a Wild West twang, harking connotations of the primitive western ‘every man for themselves’ adage. Technically, the film is better than proficient. It is wholly engaging. 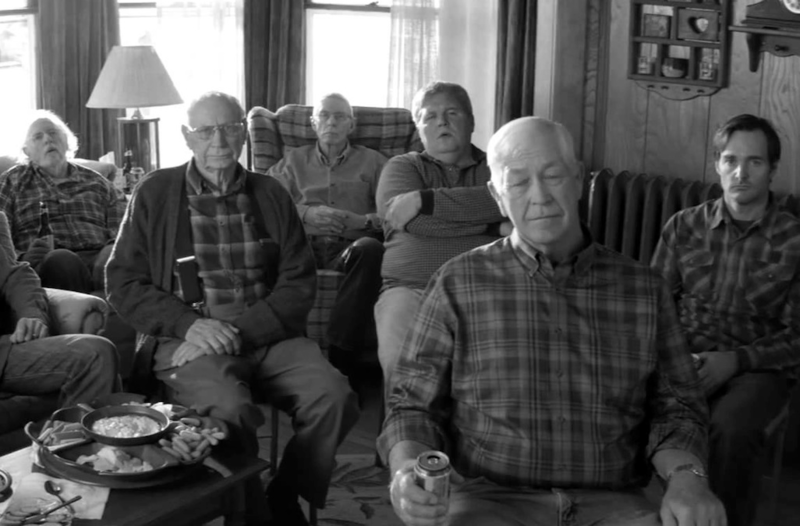 Having communicated the industrial superlatives, I ought to focus on the film as a depiction of characters, because without doubt Nebraska is about people and family and relationships. Those, and the subsequent pile of complex baggage associated with such humanistic tendencies. Although Woody isn’t the most amiable chap — his monetary determination prevails above all else — the viewer still sympathises with him to the point where you are subliminally rooting for the lead to walk away with a heap of cash, if only to see him smile. Bruce Dern embodies the retired Woody in all his stout manliness (“I served my country, I paid my taxes”), a portrayal that in many other hands would sway towards generic, yet Dern emits realism. But he’s also frail and his exuberance is quenched before it really gets going, demanding many a refuelling tavern trip. Will Forte is the caring son David, who stands by his father through thick and thin. Forte must act as a sufficient bumper against all of Woody’s grouchy impulses, a challenging task if there ever was. The duo are essentially a two-man act, strained as a pairing but valiant against any external threat (much like Miles and Jack in Sideways). Enter June Squibb as mother Kate, the experienced firecracker of the family, whose hilarious opening statement sets the tone for her appearance: “You dumb cluck!” The withered status of Kate and Woody’s relationship is prevalent throughout, but it’s a natural abrasion brought on through years of being together, rather than simply a clash of personalities. Squibb impeccably channels her character’s outspoken demeanour into one of protection over Woody. Bob Nelson’s screenplay is terrific, and Alexander Payne coats an affirming lesson with crude comedy. As father and son settle down at a family gathering alongside a ramshackle troupe of wordless Woodys and ditsy Davids, we watch that familiar social awkwardness at its most humorous. Cousins Cole and Bart insist on mundane car conversations, but at least someone is trying to cover over the cracks of silence. “Cole here did some jail”… maybe silence was the way to go after all. And it’s that tonal take-no-prisoners style that the film thrives on. Yet, there is a dramatic strand running throughout, one that takes its subject matter seriously. Woody is old. His senses are dwindling; he walks along motorways and unwittingly unveils his perceived monetary gain to strangers and enemies. This melancholic exercise on advancing years and losing oneself is relatable — everybody gets old, and many of us have spent time with elderly loved ones. Whilst Woody’s millionaire claims are momentarily amusing, they’re also sad in reflection as we see judgement fail him. At one point, you question Woody’s actual intentions: to chase a false dream, or to live and relive a reminiscent present? For David, the road-trip is a touching venture of discovery about the wholesome life endured by his father, a man you don’t get the impression David knows all that well, despite their familial ties. Nebraska is another successful excursion for its director. Suitable in its simplicity and subtle in its sensitivity, the film is spearheaded by three admirably relatable performances. At the end of it all, Payne reflects on trust, on bonding, and on seizing the moment. It’s nothing groundbreaking, but it is, to quote Woody himself, “Pretty good”. Well that pithy attempt at a punny title went awry. Don’t worry, this is not a post on injured bloggers, or deformed blogs for that matter. I feel like I’ve just starred in Jerry Maguire and won Best Supporting Actor, only the Blog Gods have given me more than two minutes to exclaim my thank yous. Or perhaps that’s just down to my lack of being constrained by a rapidly flowing, live three hour televised window. This is all very suave. I don’t really know what I’m doing, a bit like Jacqueline Bisset at this year’s Golden Globes. Okay, maybe not that bad. Or externally influenced. I digress, taking my lead from the business’ best and most bumbling in doing so; this isn’t about me, this is about all of you brilliant people – and occasional spam-bots – who read my film ramblings. Particularly, a huge thanks to the wonderful Cara over at Silver Screen Serenade whose insightful, funny and positively effervescent blog is a must read for film fans, television nuts and life folks in general! Check it out now if you haven’t already done so (though I’m sure you have). 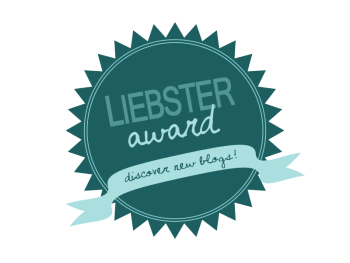 I’m also following Cara’s awards blog layout, because it’s far too nifty to ignore. Nominated bloggers must link back to the blogger who nominated them. Nominees must answer the eleven questions set out by their nominator. Nominated bloggers must also select eleven other terrific blogs with less than 200 followers – though a few of mine are a little above that figure – nominate, and then prescribe them eleven tantalising questions (or, make up some head-shakingly unimaginative queries, as I have done). If nominated, you cannot nominate the person who originally nominated you. Anyone else starting to verbally trip over that nonimate, err, nominate word? Enough about rules, down with the machine! etc. Being Scottish, I’ve spent many a holiday abroad over in Spain (we’re very particular, apparently). I did go to America a few years back though, when I played football (soccer), and absolutely loved it. The whole team went over; we paired off and lived with American families for most of the trip, and I was based in a wooded, pristine Pennsylvania neighbourhood. After spending a day in New York, I eulogise over returning. Red, as you can probably tell looking at my blog’s header and logo! Shockingly, I’m not a big dessert guy (or a big guy in general, so it’s not really that shocking after all) but I do enjoy vanilla ice-cream stacked on top of a warm chocolate fudge cake every now and again. It’s a Wonderful Life, without question. That film is delightful. I’ve never read a comic book, so purely based on films and television shows, Batman. Chris Nolan made Batman cool again. Don’t ruin it Snyder. This is a tough one. I watch far too much TV, and often have upwards of ten different series’ recorded and ready to watch. I’m gonna have three, because ‘down with the machine!’ etc., remember? Two that aren’t on anymore but are crazily different and therefore I cannot separate: Friends and LOST. I got into Friends over in the States actually. We watched it almost every night and I became glued, such a smartly humorous, charming show. LOST, I watched from start to finish as it aired on the tele. It gets a bad rap for the finale, but it absolutely had me going. A truly stupendous first season. Of the current shows on air, it’s gonna have to be The Walking Dead. I’m intrigued by the whole zombie/apocalypse (and zombie apocalypse) genre. Having said all of that, True Detective begins over here tomorrow and I’m big on Matt McCon at the moment – we’re on a nickname basis. I don’t read as much as I should, but off the top of my head I’m going to pick The Hobbit. It’s all very adventurous, and funny, and good-natured. “Let It Be”. Sorry for being so generic! Labrador, like the little guy in those Andrex adverts! I’m a sucker for Citrus Oasis, or any other orangey drink. Alcohol-wise, I’ve only really ever tried Budweiser, and haven’t consumed alcohol since! 11. Nerdy franchise (Harry Potter, Lord of the Rings, Marvel, etc.)? Nerdy franchise? Hmm, evidently I’m quite a nerd when it comes to anything in the film (and television) Milky Way, but The Lord of the Rings is my favourite film trilogy/franchise so I’ll go with that! Now, here are the magnificent 11 I’d like to give a shout-out to! Name one film that you have yet to see, but should’ve seen by now. Do you keep a list of every film you watch, and when? What is the first film that comes to mind when you read the following word: Guitar? What is your favourite Leo DiCaprio film? Name a film that you personally dislike, but that everyone else seems to love. What is your first film-related memory? Do you listen to any film podcasts, or radio shows, or watch any television review shows? Does the phrase “Hello to Jason Isaacs” mean anything to you? Was The Phantom Menace really THAT bad? What is your favourite film that is underappreciated elsewhere? When you hear the name Shia LaBeouf, what type of meat springs to mind? Oh, and if I’ve utterly messed all of this up and ruined the award-chain, I will repent at the feet of the Blog Gods for the rest of eternity. Author Adam (Consumed by Film)Posted on February 21, 2014 May 21, 2016 Categories Awards, FeaturesTags Academy Award, Award, Film, Liebster Award, Movie, Oscars, Television7 Comments on The Blogscars! Those purposeful words, you will have heard over the last few months in trailers, adverts and previews. They are strong-willed; in one sense uplifting, yet in another more visceral sense, haunted by humanity’s most evil endeavours. Despair and freedom, traits inversely diverging in the life, rather, the existence of Solomon Norfolk. Steve McQueen challenges us to consider and then reconsider as his depiction of the animalistic slave trade hammers with shock, but does not rely on it. For the most part, the moments of solitude and silence profoundly exhibit a monstrous reality lived by those such as the remorseless slave owner Edwin Epps. There are no punches pulled, no whippings recoiled; McQueen’s 12 Years a Slave is a harrowing watch without question. More than that though, it is a necessary watch. Not to reassure a cultural ridding that hasn’t fully been expunged. Rather, to condemn what should never have occurred, and to shed a flicker of true resilience on a truly despicable time. A well-off and considerate skilled carpenter, Solomon Norfolk (Chiwetel Ejiofor) tends to the every need of his young family. It’s 1841 and the slave trade is rife with wealthy disregard. Approached by two not noticeably iffy gentlemen, Solomon — a fiddle player at heart — is offered an extended musical job, an offer greeted with appreciative acceptance. After a drunken night, he awakens in chains, stripped of his identity and mercilessly pawned. 12 Years a Slave tells Solomon’s harrowing story, as he is traded from a would-be sympathetic slave owner (that is, if such a juxtaposition exists) to the vile, despicable Edwin Epps (Michael Fassbender) who has abomination clenched in his fists and the abyss peering through his eyes. This is an intense watch, no doubt. Not necessarily because it’s another retelling of a horrible time — though that alone warrants attention and denouncing. Rather, it comes down to how Steve McQueen unflinchingly tells the story. His directorial application is admirable in that no disservice is done to those who fell victim to slavery, this isn’t in any remote sense a Hollywood-esque drama bloated full of riveting set pieces or manipulative tones. Nor is it buoyed by a somewhat ironic, semi-exploitative raft akin to that of Quentin Tarantino’s Django Unchained, a cinematic spectacle in every sense. 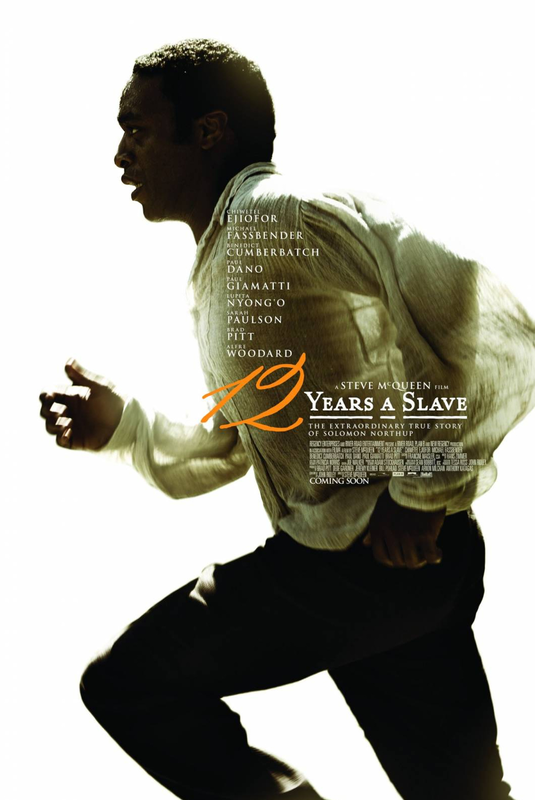 12 Years a Slave is real life, a reflection of events not so long gone. You may judge success on ticket sales, or audience reception, or even personal affirmation, but there’s also a genuine feeling abound that McQueen’s priorities are and would always have been aligned alongside authentic storytelling regardless. His straightforward devotion to re-imagining the unimaginable is admirable, and it’s this wholeheartedness that enables the viewer to watch with an only just an ounce of ease, but an ounce nonetheless. From the point of his wrongful capture, Solomon wrestles with a tragic dignity-driven dilemma: does he succumb to hate to become bastion of support for his helpless compatriots already grappled by despair, or does he stoutly, fearlessly stare directly into the heartlessness of one of humanity’s worst episodes? Initially, Solomon is disbelieving, perhaps as much of slavery’s existence as of his own forced manoeuvre into it. “They were not kidnappers, they were artists… fellow performers,” he wrongly assures, detailing those absolutely iffy gentlemen. Maybe if he can convince someone, anyone, they’ll see sense. But there is no sense, not in the racist pits of Southern USA. Everywhere Solomon glances there is a monster in human skin. The slave-trader, auctioning off people like watches (“My sentimentality stretches the length of a coin”). The plantation owner, who treats his slaves fairly well — but to treat a slave well would be to treat a slave as a human, not an object, therefore not to treat a slave at all. His empathy is misguided. The hired carpenter, a white pre-Nazi figure teaming with abhorrent spew. Yet through these early trials, Solomon remains resilient and hopeful — freedom is still vaguely in sight. 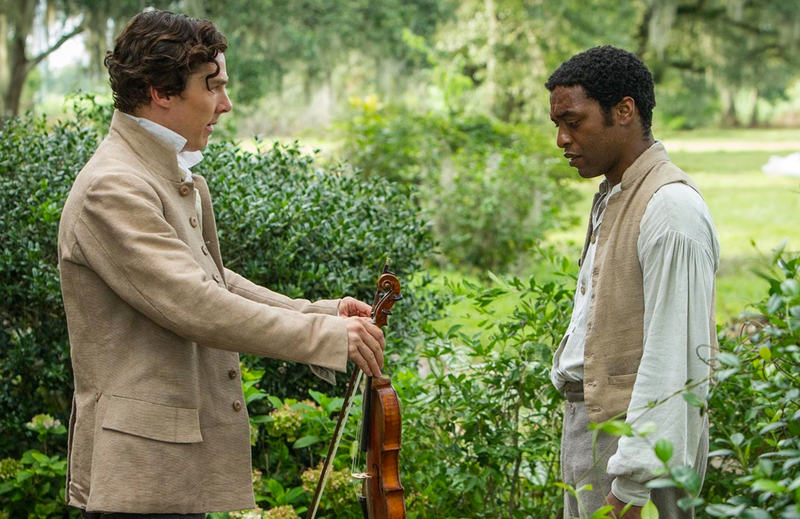 Wholly, 12 Years a Slave is mighty, but a number of moments stand out in their contrasting potency. As a twenty-first century audience, we’ve sponged it all, and have resultantly become immune to most atrocities displayed in film or any other art-form. There’s something to be said, then, for an act of depicted violence that leaves you mouth gaping, eyes watering and mind searching. In a sickening whipping display not far removed from The Passion of the Christ, the film emphatically compounds its horrors. Yet it remains realistic, and that rankles the stomach. Conversely, a scene of isolation is striking. Surrounded by an audibly hissing nature, pupils dark and eclipsing, Solomon slowly stares right and left before catching the camera’s lens. Profound, absolutely. Painful, worryingly. You wonder whether Solomon has approached the point of no return, the despair, and assume thereafter that he has seen no end. It’s an extraordinary piece of filmmaking, perhaps the most poignant all both in delivery and meaning. Chiwetel Ejiofor’s depiction of Solomon is utterly remarkable. He is defiant in hope, upsetting in pain and compelling throughout, embodying this range in absolute earnest. The role is a difficult one; Ejiofor must reign in grief and disperse it invariably at the correct moments, or risk devaluing the man. At the same time, Solomon’s sympathetic nature cannot restrain, and instead Ejiofor has to symbolise at least partial hope where there is none. Ejiofor masterfully accomplishes all of this, and more — every strained note from his mouth rings with plea, and his eyes bulge with emotion. As diabolical slave-owner Edwin Epps, Michael Fassbender demonstrably bewitches himself in a spell of pure evil. At one point Epps falls flat on his face, yet you cannot muster up the slightest node of joy because it’s obvious that his repulsive mindset enjoyed the discomfort. Newcomer Lupita Nyong’o is also incredible. She plays Patsey, a young female slave whom Epps fantasies over and hates himself for it. Nyong’o displays an air of vulnerability, whilst at the same time commanding the screen with her undeniably astute presence. Paul Giamatti has a minor role as the aforementioned slave-trader, excelling in cruelty, the same uncaring sensibility as Paul Dano, the aforementioned hired carpenter. Brad Pitt oddly appears as a different carpenter, Amish beard and all. His random arrival is slightly off-putting, though the co-producer of the film (ah, that’s why) is solid enough. Benedict Cumberbatch is William Ford, the empathetic plantation owner whose sentences begin with an English accent and end in a southern drawl. Having said that, Cumberbatch is an excellent choice to play the role, that much-loved real life personality giving the character some small semblance of decency. Sean Bobbitt’s cinematography is exquisite, offering a pristine vehicle for the film to vibrantly beam out of. A contagious scent of excellence must’ve attached itself to each component on set, and Hans Zimmer’s score is no different. Moving and soaring, Zimmer’s orchestral harmonies wrap around events on screen as if to comfort the forsaken humans. This contrasts with the weighty Roll Jordan Roll, a roar of solidarity that you don’t want Solomon to contribute to for fear of his own confirmation of plight. If not the best film of the year, 12 Years a Slave is certainly the most important and probably the least comfortable to watch. Steve McQueen powerfully unravels a horrific period lived mercilessly by those far wickeder than any revised history suggests, and endured harrowingly by those whose suffering is unrelenting in its depiction. It’s stark and honest, so much so that you’ll exit the cinema, mind image-strewn, wishing the film never had to be made. It’s not often you watch a drama about the culmination of a woman’s fifty year search for her long lost son, and end up spending a significant amount of time laughing in the wake of an odd comedy duo. Settle down at the mercy of Stephen Frears’ Philomena though, and that’s exactly what’ll happen. At its heartiest the film flows with a sense of uncertain determination embodied in diverging ways by the two lead characters, but in between these moments of bottled up emotion, at its most organic, Philomena charms in tone and entertains by way of a banterous dynamic. This incredible story pitched excellently is often funny, occasionally shocking and always peculiar in believability, even if it does lose some legitimacy at its conclusion. Philomena Lee (Judi Dench) stares wholesomely into the eyes of a young gentleman pictured inside a piece of jewellery. It’s her son, Anthony, taken fifty years earlier and placed in the care of an American family. Philomena spent her younger years as part of an Irish Abbey, sent there by her disapproving father in a rebuttal to pregnancy. By chance, recently fired Labour government adviser Martin Sixsmith (Steve Coogan) is in attendance at a party where he is approached by Philomena’s daughter who pleas to have her mother’s tragic tale exposed to the world. It’s a “human interest story”, or for Martin, a way back into the positive glares of journalistic limelight, and so he embarks on a journey of discovery and hope with Philomena. At the centre of the film is this weird dynamic shared between Philomena and Martin, one driven by religion and faith (or, in Martin’s case, the lack thereof). Having been forcibly separated from her child in an act of apparent punishment, Philomena retains a staunch belief in God and moreover, treats the present day nuns — of which still includes the prominent Sister Hildegard, who was instrumental in said previous events — with respect and without any incrimination. The horrendous actions undertaken in 1951 are presented in a unsavoury manner, as they should be, by both the film itself and just about every character, from tainted journalist to boisterous pub owner (“What about the evil nuns, what’s happening with them?”). Yet Philomena valiantly, admirably, stands by her beliefs and wholly practices the forgiving teachings, ensuring the narrative never plumbs over into anti-Catholic territory. On the other hand, Martin embodies the typical cynical reporter. He spends half of the time answering his elderly associate’s questions about believing in God (“No”) and the other half truly puzzled by Philomena’s strong-willed demeanour. The journalist, who experiences a moral realignment himself as the film canters on, publicly denounces Philomena’s inbuilt faith having never sincerely lived it — although he was an alter boy once upon a time. These quizzical debates between the pair provide the catalyst for the film’s good-humoured underbelly. That, in tow with the chuckle-worthy “little old Irish lady” and business-like, trying-to-reignite-him-career journalist, together in America, heralds a jesty atmosphere. The pair are outwardly mismatched, yet they share an intrinsic desire to reclaim a significant loss in their respective lives. For Philomena it’s her son, whereas for Martin it’s his dignity and journalistic aura, which is probably why he constantly contemplates writing a book about Russian history, a cultivated topic if there ever was. His initial detachment broods a condescending resonance towards Philomena, whose fickleness in the face of sarcasm offers a few comedic titbits. While Martin discusses how to approach divulging the story with his callous editor, Philomena amazes over the “the size of the portions!” in America, claiming she always worried about her son’s weight. While fully endorsing laughter, director Stephen Frears never marginalises his at times serious approach to the subject matter, without which the film would lose authenticity given the harrowing happenings occurred in real life, as part of Philomena Lee’s actual existence. A healthy balance is essential, and Frears achieves one. Our two main protagonists are, in essence, conventional characters — a dour, disenfranchised reporter and an energetic-yet-inconstant wee Irish lady — but given the film is based on a true story, on genuine people, it is right that these characters should be conventional to a degree. That way they are recognisable and relatable, in turn evoking emotion from the audience. Judi Dench is wonderful as Philomena, humming the full dramatic spectrum in the process. She exhibits an ardent perseverance, the same kind that any mother would typify in a search for her child. However, at the same time she always carries that homely quality, a charming awkwardness in a world far bigger than and increasingly alien to her. As Martin Sixsmith, Steve Coogan is the perfect folly, boasting a very valid ‘been there, done that’ attitude. Unlike Dench whose character is a straight-shooter from the off, Coogan often has to reign in his thoughts (probably for fear of a skelp from his elder) as he gradually warms towards Philomena, instantaneously to the audience directing a growing fondness in the direction of Martin and his changing intentions. Along with Jeff Pope, Steve Coogan brilliantly co-wrote the screenplay based on Martin Sixsmith’s book The Long Lost Child of Philomena Lee. The duo do an exemplary job in adapting book to the screen, a traverse that facilitates this witty, emotionally-tugging film. Nevertheless, there is a problem that arises near the very climax, one captured and dragged by the notion of dramatic licence. Dramatic licence, a function utilised by the industry’s best, creates tension where there may be none, or sprinkles a share of humour if it sorely lacks. 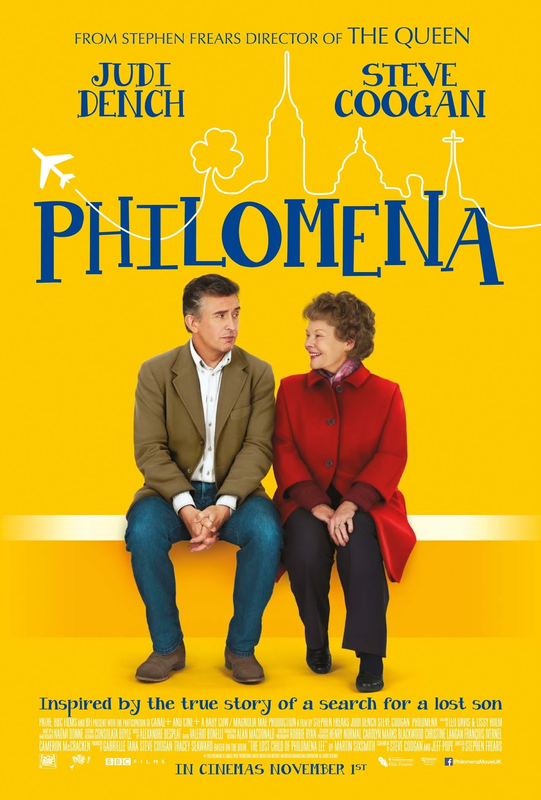 In the case of Philomena, the dramatic licence becomes problematic because it goes beyond these constructed trivialities. There is a fabricated scene approaching the conclusion that is designed specifically to be a blow-off moment for Martin, but that resultantly, sadly, envisions a significant falsity. In a way the film takes an emotional liberty, the same kind that it spends ninety minutes preaching against. A disappointing blemish, but arguably the only one. Martin Sixsmith, worried about his health, is told to run. This same deed is adhered to by Steve Coogan and Judi Dench, who collectively grab hold of Coogan’s delightful — if a tad tainted towards the end — script and run with it, creating waves of charm and seemingly incompatible comedy in the process. First and foremost though, this is a serious and harrowing story, and Frears ensures that it is treated as such. 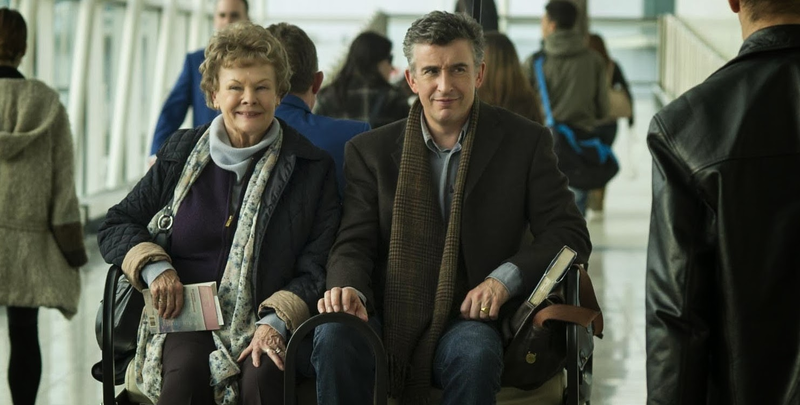 If you journey purely alongside the happenings on screen, not investigative of the climactic authenticity, Philomena might just tinge those emotions; the laughs and the cries. Ray Charles’ drive and charisma gave him a larger-than-life persona, so big that even a severely musically deficient 20-year-old knows who he is. Unfortunately, and indeed surprisingly, Taylor Hackford’s biographical drama about the electric man struggles to maintain the energy that Charles himself boasted in abundance. This is by no means down to Jamie Foxx’s sizzling turn as the title character, or the foot-stomping, arm-swinging music splashed throughout, but instead is a result of a pretty dreary and repetitive narrative presenting a story that deserves so much better. We see music in his eyes. His effortless piano-playing hands are reflected in those iconic sunglasses. Ray Charles is at one with sound. This is the opening shot of Ray and if you didn’t know already, you do now — he is the music man. The film details the rise of Ray Charles Robinson, a young boy who became a pioneering musician after a childhood ravaged by tragedy and loss. Growing up in the 1930s on a Northern Florida plantation, young Ray and his brother are cared for by their head-strong mother as they bounce with liveliness amongst the dust. The duo share a close bond and get up to just about as much mischief as any other child does, but it is the tragic loss of his brother that kick-starts the chain of events which will eventually see Ray completely blind and hugely successful. His mother, played magnificently by Sharon Warren, teaches Ray that his deficiency is only such at the surface, that he needs to learn to live and strive on his own (“Remember you’re going blind, but you ain’t stupid”). Warren may just be the star-turn behind Foxx here, as she movingly portrays a woman who is a beacon of strength driven by frailty, and justifies the inclusion of countless conveniently placed flashbacks. Ray’s childhood in Florida is depicted throughout the drama by way of a number of flashbacks, and these provoke part of the film’s main problem. Unlike the rhythm heard from Charles’ music, Hackford wrestles unsuccessfully in his attempts to generate and maintain a rhythm on-screen. From the get-go proceedings are frantically hurrying forward, making it difficult to catch a breath never mind work out where and when we are. One moment a young Ray Robinson is shown as he grows up, the next he is moving away to school and then before you know it Ray Charles is belting out soulful music to the needy masses. The film is long — overly long at two and a half hours — and by the time the first sixty minutes are up, the audience has seen just about everything there is to see… so we see it all again. Charles develops a drug habit, he plays a gig, he records a song, he takes some more drugs, he buys a house, another gig, recording studio, perhaps the odd forced flashback for narrative continuity, and so on. The film begins to drag, which is a shame considering its subject matter defined entirely the opposite: pizazz and meaning. That being said, the life lived by Charles was without doubt a tumultuous one, one which incorporated extensive drug use and adultery, and these issues are sidelined to an extent in favour of jovial music and exuberance. Often arguments end in laughter when they need not. Perhaps this genuinely was part of the man’s all-round demeanour — his music certainly alludes to joyfulness. However, creative license appears to be prevalent as intentions to make Charles look like a bad guy are non-existent. Again, considering its enormous run-time, delving into the depths of some of the more unattractive issues in Charles’ existence would’ve benefited the film — when a smidgen of Ray’s post-addictive exterior is displayed it is tough to watch and this is more of what the film needs in order to really tell his story. Charles does not need to look like a bad guy — by all accounts he wasn’t one — but rather a good guy who done a few pretty bad things. On the plus side, Jamie Foxx knocks the proverbial ball out the park and then some in his performance as the soul singer. 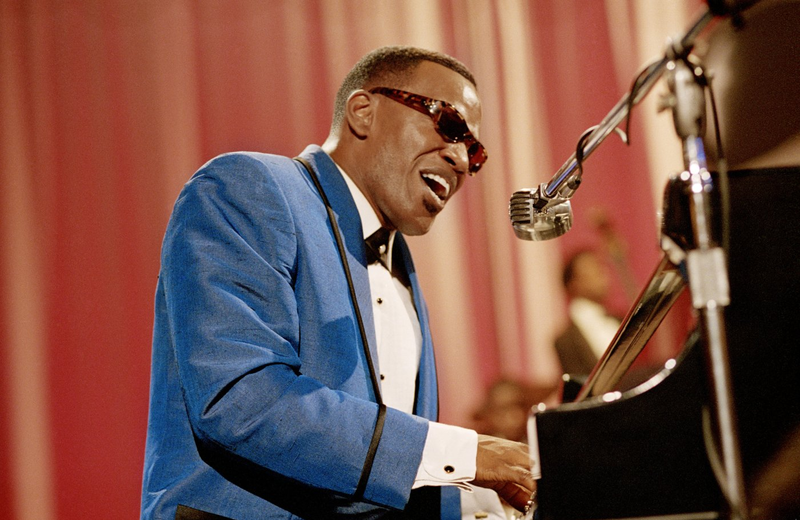 In a similar vein to Joaquin Phoenix’s turn as Johnny Cash in Walk the Line, Foxx truly brings Ray Charles to life on screen. The key to his successful embodiment is just that: an outstanding use of body movement and facial expressions. Unable to deliver the goods through his eyes, which often provide the backbone to showing emotion, Foxx incorporates all of Charles’ movements and intricacies by way of a rasping shriek or emblazoned smile. It is evident that Foxx has worked hard to achieve what he does, and his award-winning achievements are magnetic. The film is beautifully shot by cinematographer Pawel Edelman, who was nominated for an Academy Award in recognition of his work on The Pianist, and maybe his offerings in Ray should have earned him a second nomination. Alongside Foxx’s charismatic performance and a collection of delightful music, Edelman’s expert, scene-setting shoots provide Ray with all of its energy and charm, in spite of the dreary screenplay. Regardless of how repetitive it might get, or any imagination-scarcity it might suffer, you cannot help but smile when Ray Charles learns how to play “Mess Around” on the piano. 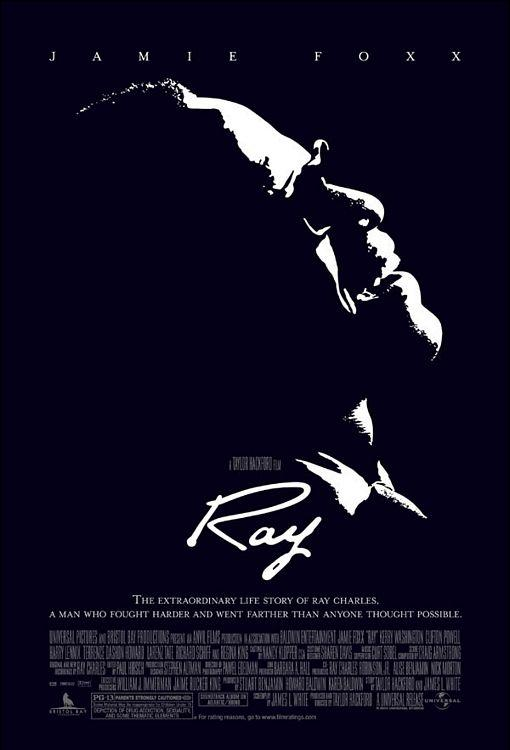 Ray is not a bad film by any means; it provides the vehicle for an incredible embodiment of one of the most influential men in music history courtesy of Jamie Foxx, and also accommodates a number of grin-inducing moments alongside an exclusively feel-good message. The film is let down, however, by a lack of creativity in the narrative department, turning the story of an incredible man’s inspiring journey into a bouncy-castle of repetition before long. By the end, or even the middle, it sort made me just want to go and watch Walk the Line again. Having directed films such as The Bourne Ultimatum and United 93, Paul Greengrass is no stranger to generating drama and thrilling audiences. In Captain Phillips, Greengrass combines the very best elements from his previous outputs and creates a relentlessly intense and enthralling tale of an ordinary man in an extraordinary situation. The film tells the true story of Captain Richard Phillips, who was taken hostage by Somali pirates while steering his cargo ship across the Indian Ocean in 2009. 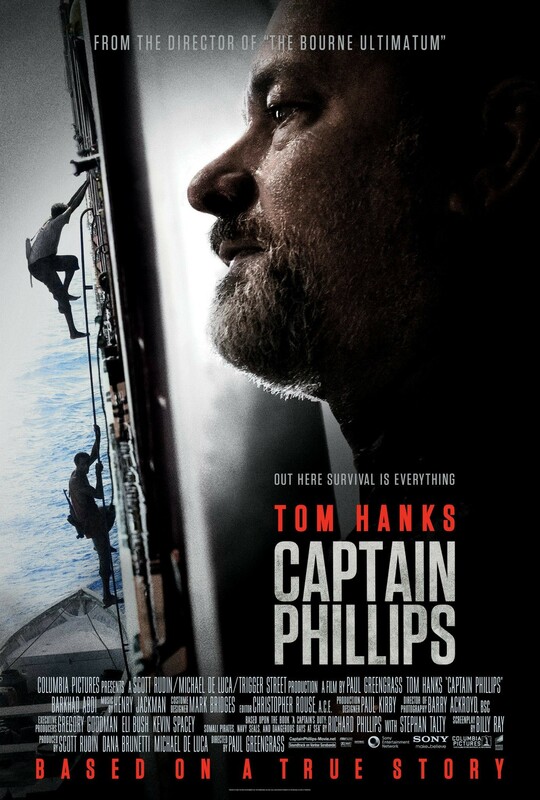 Tom Hanks stars as the troubled captain and delivers his best performance in thirteen years. The two-time Academy Award winner’s thoroughly convincing portrayal of the jaded mariner turned distressed captive is incredible — his astounding role in the emotionally-charged final few minutes of proceedings should seal Oscar number three come March. 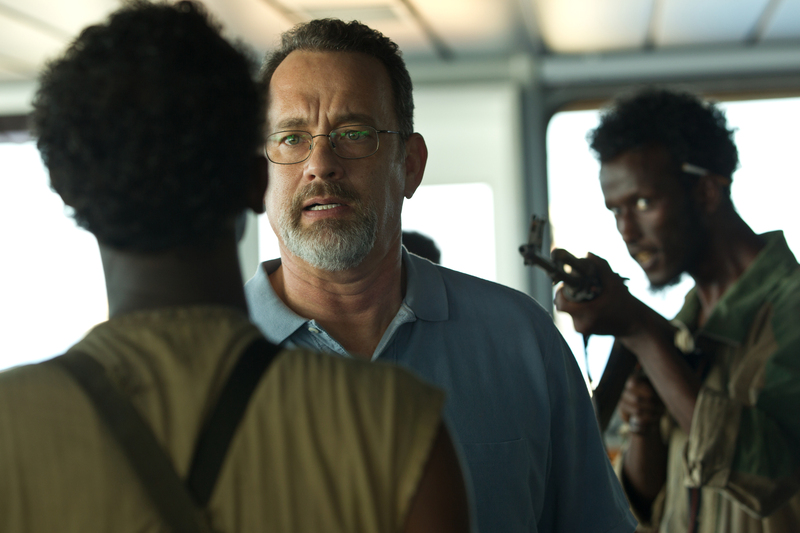 In addition to Hanks’ performance are the surprisingly realistic offerings from the four previously untried actors playing Somali pirates. The group are imposing and chaotic, with Barkhad Abdi standing out in particular as the leader, and the quartet’s pursuit of the American-based vessel amplifies an already danger-fuelled atmosphere struck up by eerily droning music and Phillips’ on-edge demeanour (“We’re going along the Horn of Africa, right?”). More than simply a story of immediate survival, the film also has a political and moral backbone. We see two very contrasting lifestyles in the opening shots: one shows a worn-out family man about to leave his wife on another extended job; the other depicts a struggling community whose only means of survival is criminal activity. Greengrass infuses these extremely current issues into the main plot-line to add another real-life layer of drama to the impassioned events. Technically magnificent and emotionally draining, Captain Phillips boasts award-worthy lead performances and is without doubt one of the very best films this year. Folkish melodies and acoustic guitar strums are the backbone of Scott Cooper’s Crazy Heart, a charming tale about a worn out country musician who finds hope and inspiration in a new, unexpected romance as he tries to get his career — and life — back on track. Jeff Bridges is Otis “Bad” Blake, an ageing country singer/songwriter devoid of much enthusiasm unless alcohol is present. Maybe he lived a more frivolous and extravagant lifestyle in his younger years, but nowadays his tours consist primarily of small town bars and bowling alleys. If he makes it through a set list without choking on a beverage or vomiting in a bin, he’s probably having a pretty good day. Bridges is excellent as Blake and delivers equally well in conversation as he does in song. Maggie Gyllenhaal’s youthful journalist Jean Craddock is a recent divorcee who catches the eye of Blake and emblazons him with a new lease of life. The two actors strike up a a very equitable dynamic and make a seemingly unrealistic relationship, a believable one. Just as Blake and Craddock’s romance progresses and the country man’s life and career both begin to reattach themselves to the rails, Blake encounters a number of alcohol induced demons, including a number of unsavoury incidents involving a car accident and Craddock’s four-year-old son, whom Blake has come to care dearly for. These issues increasingly drive a wedge between the pair and as their relationships begins to unravel, the film starts to lurch over the edge, peering cautiously into the depths of despair and darkness. Teetering on the edge of the abyss is as far as the drama gets however, as the film does not quite have the courage of its convictions. And that is the main problem with Crazy Heart (perhaps the only problem). Too often characters are faced with a level of pain and anguish which, if prompted a little more, would generate additional degrees of empathy and frustration for them — and Blake in particular — from the audience. For a man who is surviving mainly on scraps and minuscule effort, who finds a beacon of light through love and family and who then goes on to throw all of that joy and security away by making stupid decisions, Blake seems to be dealing with life relatively well. Yes, he has a drinking problem, but he has the same drinking problem at the beginning of the film as he does after the collapse of his relationship. Scott Cooper is very close to writing and directing a perfect fable of loss and redemption, but the tone of Crazy Heart lingers a touch too high when it should be free-falling a great deal lower – Darren Aronofsky’s The Wrestler is an example of a film that shares many similar narrative elements with Crazy Heart, but which hits depths lower than Cooper’s film and is all the better for it, albeit more heart-wrenching. 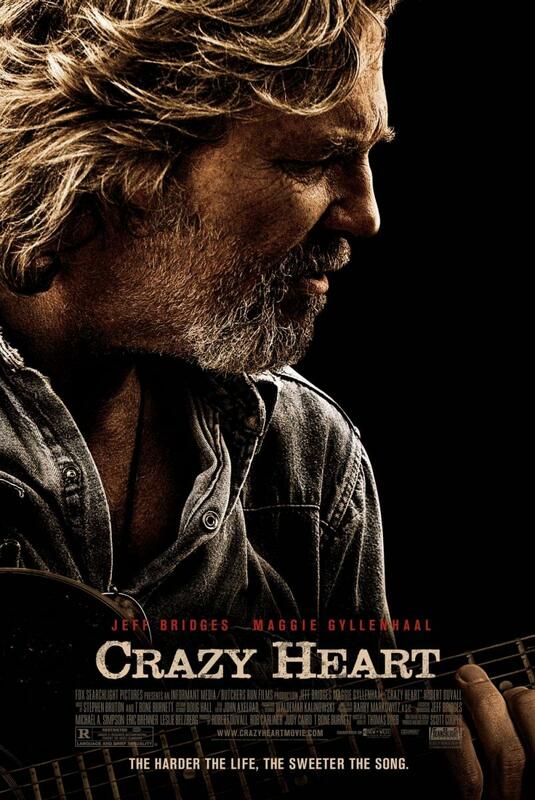 However, what Crazy Heart does not have in depth-plummeting ordeals, it makes up for in wonderful characters, tremendous performances and an incredible plethora of music. Produced in part by Coen favourite T-Bone Burnett, the soundtrack to the film has bounce and soul and meaning; it is no surprise that the film’s headline song “The Weary Kind” went on to win the Academy Award for Best Original Song. Often the songs develop the characters, be it through Colin Farrell’s rendition of “Gone, Gone, Gone” establishing his young, successful Tommy Sweet, or Jeff Bridges’ interpretation of “Fallin’ & Flyin'”, which perfectly describes both the singer’s previous ambitions and current realisations (“Funny how fallin’ feels like flyin’ for a little while”). Burnett’s musical involvement in filmmaking rarely signals disappointment, and his work here is another shining example of getting it right. 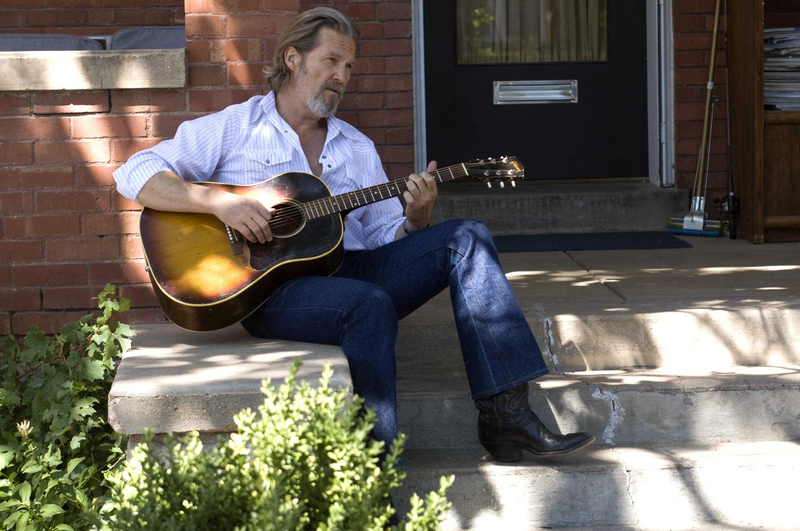 Jeff Bridges is the stand out performer in a film where much of the focus is on him, delivering a performance which returned the second of the film’s two Academy Awards in 2010. He is a part of just about every scene, yet his presence is always welcome and never wearisome. Bridges emits near-defeat and hopeful optimism in equal measure when required, his emotions often dictated by the outcome of interactions with the protégé-turned-star Sweet or the smitten Craddock. Robert Duvall even makes an appearance as Blake’s lifelong friend Wayne, contributing melodically to match. When the foot stomping ends and the guitar strings go silent, Crazy Heart simmers down to a very enjoyable film that boasts an exceptional lead performance and is littered with great songs, each of which do their job in encapsulating the moment. It doesn’t quite hit the perfect note all of the time, but it is not a long way off.